Chandrasekaran, who is also the chairman of the salt-to-software conglomerate Tata Group, says Tata Steel aims to increase its capacity in India from 13 million tonnes per annum currently to 25 million tonnes. Tata Steel Ltd will be able to nearly double its capacity in India as a deal between its British entity and Germany's ThyssenKrupp will reduce the Indian parent's debt, the chairman of the company said on Monday. 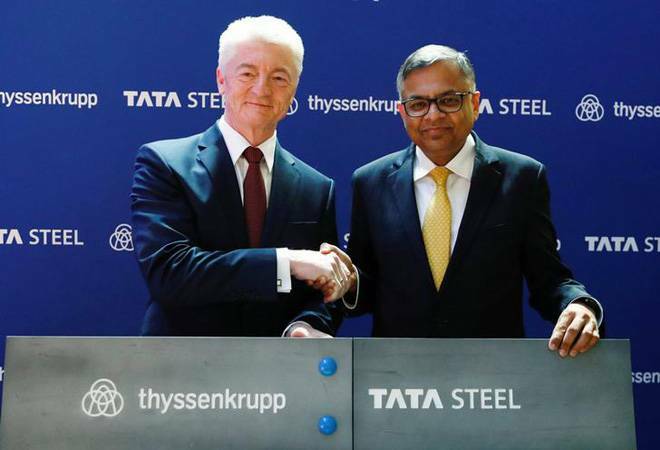 Tata Steel and ThyssenKrupp signed a deal on Saturday after months of negotiations to form Europe's second biggest steel company in which Tata and ThyssenKrupp will have a 50:50 partnership. "Because Europe becomes stronger, it reduces our leverage," Tata Steel Chairman N Chandrasekaran told a news conference in Brussels that was shown in India via a webcast. "(The deal) allows Indian operations to grow and address the Indian market," he said. Chandrasekaran and ThyssenKrupp Chief Executive Heinrich Hiesinger jointly addressed the conference. The deal will allow Tata Steel to transfer up to 2.6 billion euros ($3 billion) of debt on its European business to the joint venture company, relieving the Indian parent from substantial interest payments, he said. Chandrasekaran, who is also the chairman of the salt-to-software conglomerate Tata Group, said Tata Steel aims to increase its capacity in India from 13 million tonnes per annum currently to 25 million tonnes. While he did not give a timeline at the conference in Brussels, he had said in September that Tata Steel would like to double its capacity in India in five years. In the last few months, the third-biggest steelmaker in India has been one of the most aggressive companies in picking up distressed assets after a new bankruptcy code pushed several steel companies into debt resolution in India. The company picked up debt-ridden Bhushan Steel Ltd for 352.33 billion rupees ($5.12 billion) in May and has been short-listed as the highest bidder for unlisted Bhushan Power and Steel Ltd. Together, the two acquisitions would help the company to increase its market share in India while also lead to a higher debt, analysts have said. Restructuring in Europe allows the company to focus on opportunities in India, said TV Narendran, chief executive of Tata Steel, said in Brussels. "It will not be a company that will be sucking cash but will be generating cash," Koushik Chatterjee, executive director of Tata Steel told analysts on Saturday.